Howdy, folks! Hopefully y’all have some fun weekend plans for our sunny Saturday before the active pattern returns. Details on what to expect beginning Sunday, timing, and rainfall amounts are below! Yep, thats right! High pressure settled to our north will bring yet another day of clear blue skies. While it will look like a nice day to go outside, temperatures are still going to be brisk. A heavy coat will still be recommended as the high temperature will top out in the upper 30s, with winds out of the northeast at 10 mph. At least it will be above freezing. Who else is at least happy that it will be sunny? Unfortunately, all good things must come to an end. Clouds will be on the increase tonight as another active pattern looks to move in. Low temperatures tonight will be in the upper 20s. The high pressure in place today will shift east tomorrow, and will allow for a low pressure system to propagate towards the Ohio River Valley. Areawide light precipitation chances return tomorrow morning, with rainfall rates picking up Sunday night and Monday. Timing looks to start just after daybreak, so there are some questions as to precip type at onset. Cold grounds/elevated surfaces initially could allow a very light glaze to form before the warmer air gets us back to all rain. NAM has freezing rain more eastward, but we can still have some frozen precipitation if the timing is right. High temperatures for tomorrow will be around the mid 40s, so rain will dominate once temperatures go above freezing. By the evening to overnight hours, temperatures will be in the low 40s. Heavier rain showers will move in overnight, and continue into Monday. Total rainfall for Sunday looks to be around 1 inch. Not much change for Monday. All day rain showers look to be the story, similar to this past week. The GFS has rain showers continuously dumping on the area, with eventually some heavier showers and possibly some rumbles of thunder Monday night into Tuesday. 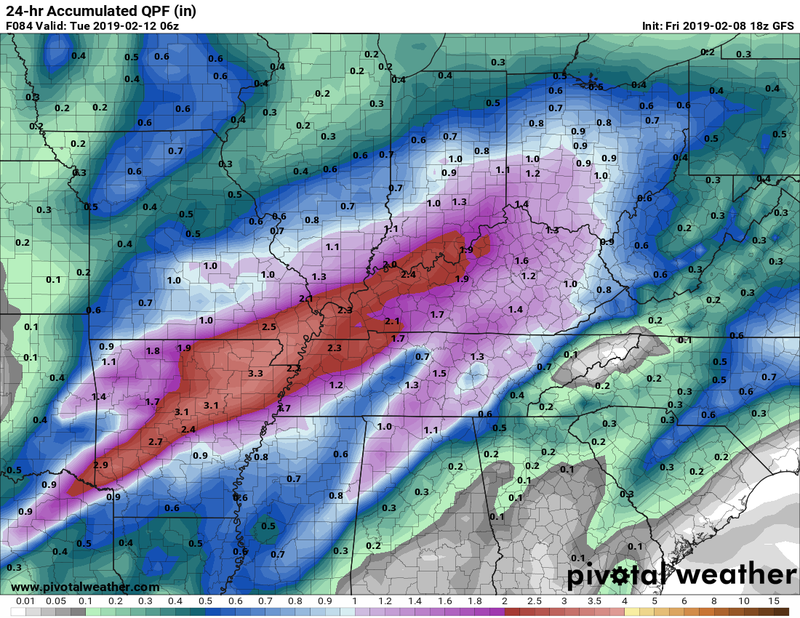 GFS currently indicates that Bowling Green will receive more than 1 inch of rain over the 24-hour period on Monday. 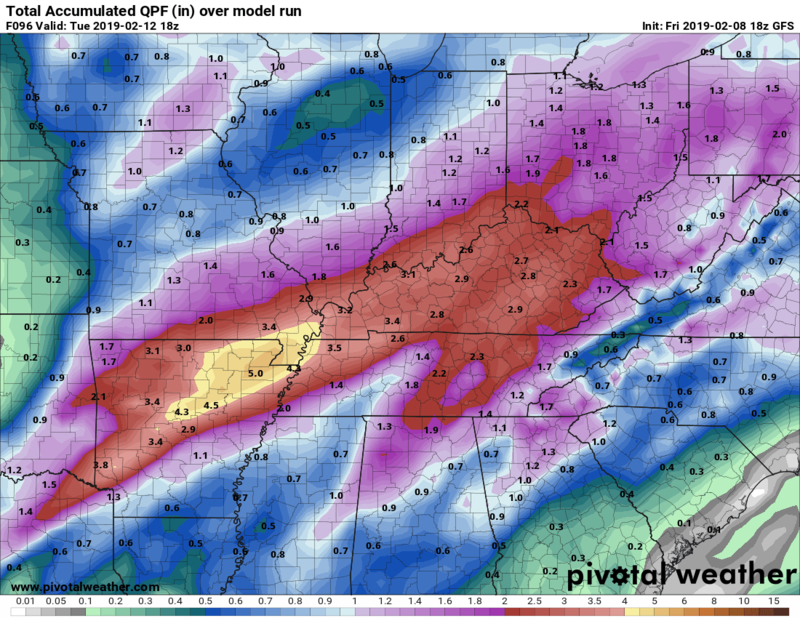 If this hold true, could create some flooding problems since the ground has not had a lot of time to recharge after last week’s major rainfall. Temperatures look to warm up even more on Monday, which is the good news I suppose. Temperatures won’t fluctuate too much. Highs will hit the mid 50s during the day, and lows will be in the low 50s overnight. Luckily, there will be light at the end of the tunnel with this system. Rain showers look to be moving eastward out of the region by the late morning hours on Tuesday. Overall, by the time this system moves out, we may see another 2 to 3 inches of rain. 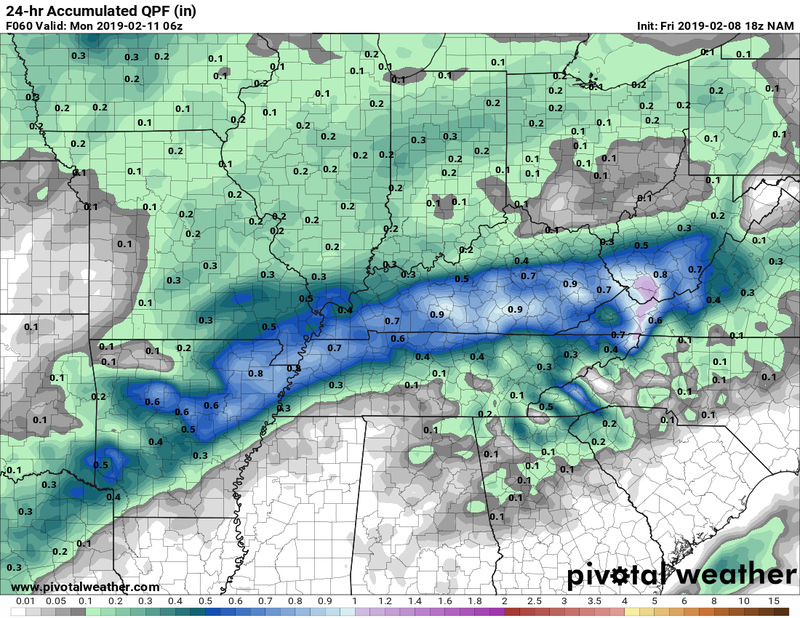 GFS has Bowling Green just under 3 inches. This will likely change, and it is strongly encouraged to stay up to date with the forecast as this system moves through. That wraps up today’s forecast. 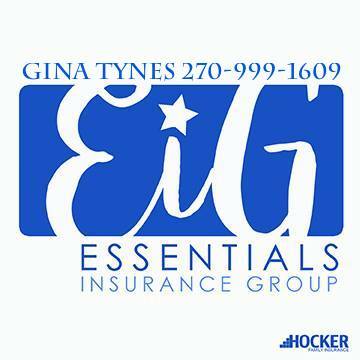 Hope you have a great Saturday and rest of the weekend! Make sure to follow @wxornotBG on Facebook, Twitter, and Instagram for weather/forecast updates.